Instead of shutting off once the desired temperature is reached, the inverter compressor continues to operate at low speed to maintain that temperature. It is quieter to operate and uses less energy than conventional ACs, which cycle on and off. Environmentally friendly refrigerant utilized in the majority of LG systems. Electronically controlled fan speeds create a more natural, random flow of air, reducing temperature stratification. Operates at high speed for up to 30 minutes to quickly cool a room down to 64°F. Automatically increases the temperature setting 2°F twice (after 1/2 hour and one hour). The interior unit shuts off when the timer setting is reached. Indoor unit accurately senses room temperature and control humidity by shutting down the compressor before a room is over-cooled. Easily accessed button allows for continued operation if the remote control is misplaced. Shuts down the indoor fan to prevent cold air from being blown into the house. Removes frost from outdoor coil when the outdoor temperature is low. Shows room temperature of interior unit. available in a variety of configurations to suit different cooling and heating situations. configurations: Art Cool, standard wall-mounted, Floor Standing and ceiling cassettes. All interior units have remote controls for easy use. well as cooling only and heat pump models, are available. LG’s Through-The-Wall models offer versatile, energy efficient solutions for residential and light commercial applications. 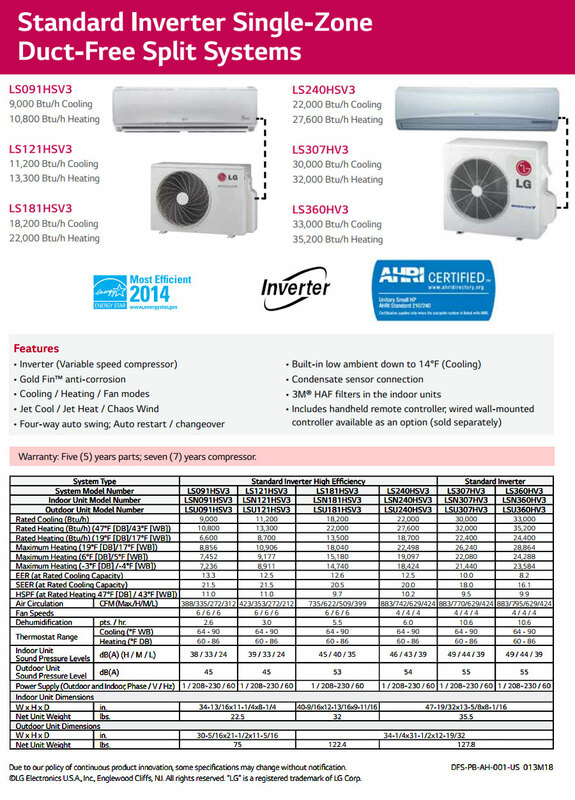 Both cooling and heat/cool models are available in a variety of capacities, with most models ENERGY STAR® qualified. The standard size chassis fits into any competitive sleeve, making upgrades a breeze. LG’s new PTAC units are perfect for lodging and healthcare applications. These units have an extremely low decibel level and outstanding sound prevention rating. Plus, LG models have efficiency ratings up to 12.5 EER, which translates into excellent energy savings. Look for these key features throughout the LG line. • Attractive, customizable indoor units. Art Cool provides numerous options to compliment any décor. The Art Cool Customizable Art Panel works like a picture frame – any art or photograph can be displayed. Other Art Cool units come in a variety of beautiful colors and finishes to suit any room. • Multi Power System.™ Energy-saving twin compressors: one provides power at 60% capacity until the system reaches a desired temperature. Then the smaller compressor takes over to provide sustained operation at 40% capacity. • Inverter. Inverter heat pump air conditioners use a variable speed compressor, rather than the constant speed found in conventional ACs. Instead of shutting off once the desired temperature is reached, the inverter compressor continues to operate at low speed to maintain that temperature. It is quieter to operate and uses less energy than conventional ACs, which cycle on and off. • R-410A Refrigerant. 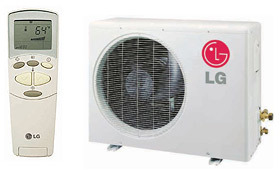 Environmentally friendly refrigerant utilized in the majority of LG systems. 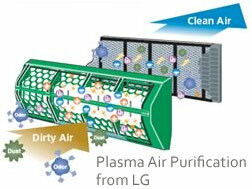 • Patented Plasma Air Purifying System. The 4-stage system features a large, permanent filter and an electronic air purifier that captures microscopic contaminants like dust, mite, pollen and pet fur. • Art Cool Self-Cleaning Indoor Coil. Drives dirt and moisture from coil surface leaving it clean and fresh smelling. • Dehumidifying Mode. Indoor unit accurately senses room temperature and controls humidity by shutting down the compressor before a room is over-cooled. • Chaos Swing. Electronically controlled louvers and fan speeds create a more natural, random flow of air, reducing temperature stratification. • Art Cool Three-way Cooling. Air flows out of the unit from three directions, creating more natural circulation. • Jet Cool. Operates at high speed for up to 30 minutes to quickly cool a room down to 64° F.
• Swirl Wind. Four-way controlled louvers and fan speeds create a stronger, wider air flow and reduce temperature stratification. • Auto Operation. Provides three levels of comfort from which to choose. Temperature and fan speed will set automatically. • Manual Power Switch. Easily accessed button that allows for continued operation if the remote control is misplaced. • Defrost Control. Shuts down the indoor fan to prevent cold air from being blown into the house. Removes frost from outdoor coil when the outdoor temperature is low (Heat Pump only). • Temperature Display. Shows room temperature of interior unit. • Auto Sleep Mode. Automatically increases the temperature setting 2° F twice (after 1/2 hour and one hour). The interior unit shuts off when the timer setting is reached. • Auto Restart. Automatically restarts a unit to programmed setting when the electricity comes on after a power failure.